Every year I look forward to going to Denali. 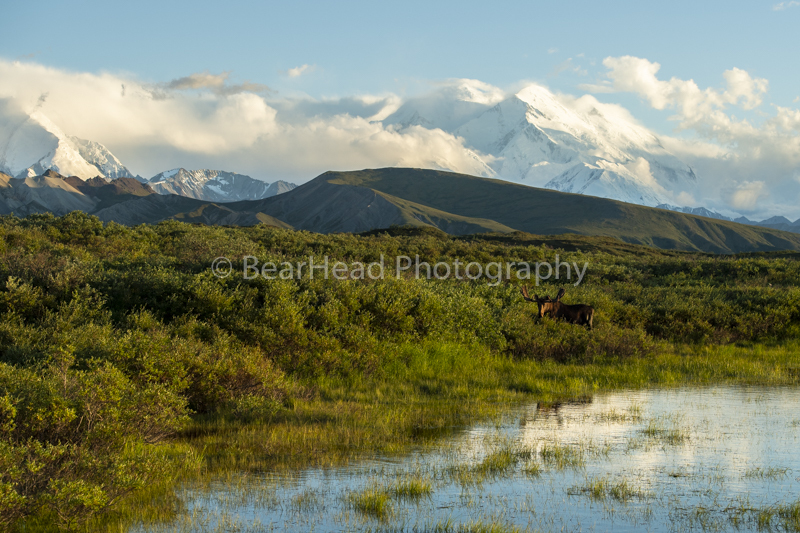 Most places I photograph have one or two animals I can photograph in that area, but Denali is different. I will go with a certain animal I want to photograph, but there are also 3-4 other animals I can photograph if I’m not finding the animal I am wanting the most. So it’s exciting because I just never know what I will find. Denali has some of the largest moose in the world, and it’s always exciting finding a monster. The problem is, the terrain is so vast that these huge moose blend into the environment. The entire first day Twila and I looked and looked for moose and our eyes hurt from scanning the terrain looking for moose. As we were leaving in the late evening to maybe find something else before dark, I spotted a moose off in the distance. It was not in an easy area to get to, but he looked big and we were determined. When we got to him, there was another bull moose there as well, and that was awesome. It may have been my best shoot ever with moose because of the light and the different shots we were able to get! After getting such great moose shots the night before, I wasn’t too worried finding some the next day. It’s such a great feeling when I am able to get great shots on the first day and I can then focus on other photos I am wanting to get. We still looked for moose, and we found some, but it wasn’t nearly as good as the night before. We spent more of the day looking for bears, and finally had a great opportunity with a mother and her spring cubs coming up a river drainage right to us. 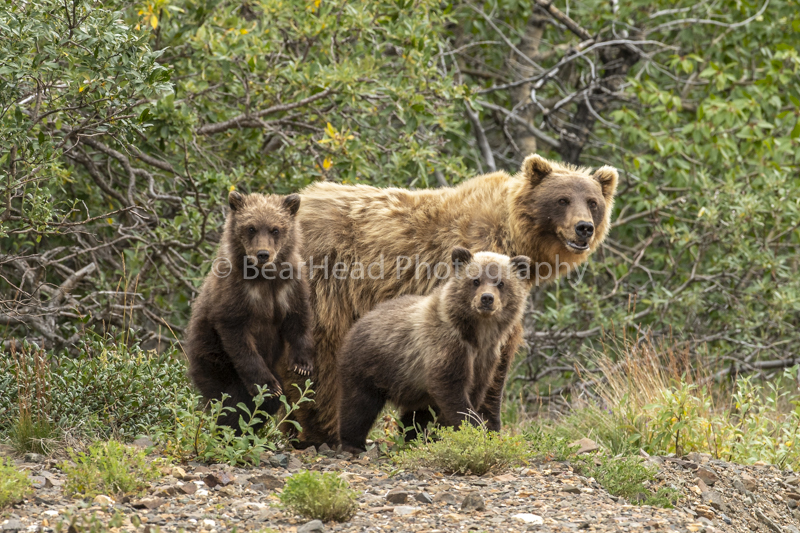 Denali is huge, and I haven’t had many opportunities with cubs in the park, so I was excited about getting good cub photos in Denali. The weather was not good the next morning, so we looked for different animals, and we were rewarded for that decision. 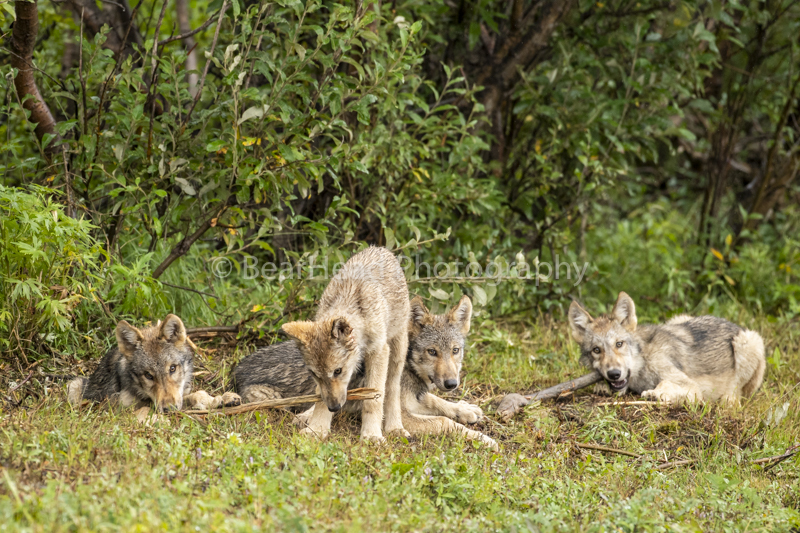 I’m not going to write in detail about our incredible experience, and truly an experience I never thought I would get to have, but I will share a few photos of the wolf pups we were able to photograph! 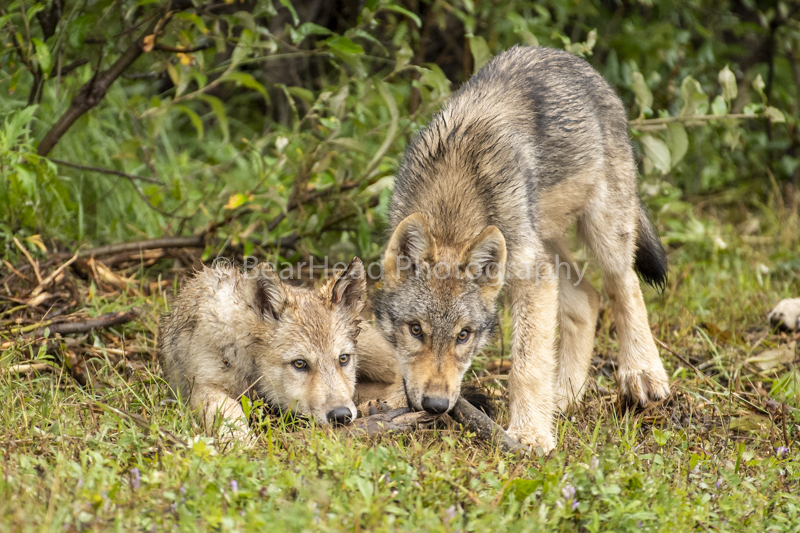 It truly was so special and I never thought I would get the chance to photograph wolf pups, but I did!!! When we weren’t watching or waiting on the wolf pups, we photographed the landscapes of the park. One super early morning we even found a lynx (Twila’s first lynx!) and were able to get a few photos of it before it disappeared. This was my best trip to Denali, and I have taken so many trips to Denali. It seemed like every day we were getting shots that were incredible! That is not normal. For a week trip if I can get two days that I get great shots I consider it a great trip, so for every day to be getting great shots, it truly was an incredible trip! I can’t wait to be back in Denali in a couple of weeks for more opportunities. In the February edition of National Geographic kids I am proud to say my photo is being used at the centerfold 2 page spread and is also a poster kids can take out of the magazine! 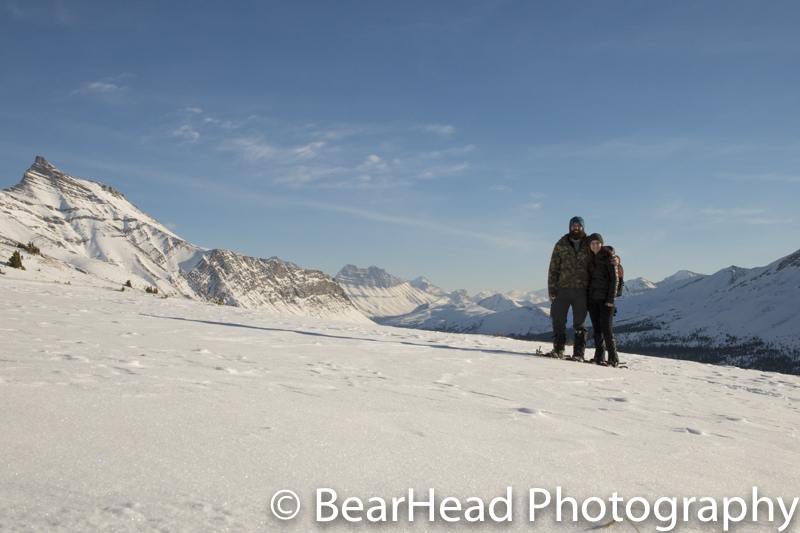 In early December Twila and I headed off into the Canadian Rockies to look for sheep. We hadn’t had much time to get out and shoot since we got married, and we were really looking forward to our winter camping trip. We had never been to where we were going, so that was exciting too! Winter camping in the Canadian Rockies is not for the feint of heart. I’m very excited that my wife enjoys being outside all the time and loves winter! We got to where we were going in the afternoon and did a scouting hike of the area. We found some tracks, but no sheep, but we at least knew they were around. The sun almost beat us down before we got back to the truck. It gets dark around 5 p.m. in the winter, so it makes the part of the day we can photograph much shorter. We got out the cooking stove and make a good pasta dinner, and finished right as it was getting dark. The temperature was dropping fast, now that the sun was down, so we hurried and got everything cleaned up and got in the truck. We had lots of blankets and sleeping bags and got cozy in the truck. It’s hard to keep the face warm in the winter while sleeping, but the rest of us did fine. It’s great to be out camping again! The alarm went off before the sunrise, and it is always so hard to get up in the winter and put cold clothes on. We had made hot water the night before, which was a great call so that we could have hot chocolate to warm us up as we got up! It didn’t take too long to get up and start snowshoeing up the mountain. It was a beautiful morning and we got up the mountain pretty fast. When we got to where we hiked to yesterday, we spotted some sheep off in the distance. After waiting a while, they ended up coming our way and we moved to get in position. It was exciting they were coming to us as there was a large ravine between us and we couldn’t go any closer. They ended up going to the ridge closest to us, and the scene behind them couldn’t have been any better! For the next few hours we moved up the mountain on our side of the ravine as they moved. Fortunately, they decided to stay on the ridge for a long time. Blazing a new trail in deep snow while photographing was exhausting. It was fun, and it was the most Twila had ever snow shoed before, but it wore us out. We got really great pictures and had a fun time getting them. We even forgot how cold it was because we were getting nice shots! On our way down the mountain that evening Twila managed to find a snowshoe hare. I have looked and looked for them in the daytime for years, and never actually found one. They don’t move in the day much and they blend in so well that they are hard to find. I was very excited to see this hare and for it to not bounce away. It cooperated and just sat there and let us take its picture. So cool to finally photograph a snow shoe hare! That night it was considerably colder than the night before. We could see our breath much more prominently, and we knew we would be in for a cold night. It was hard getting out of bed in the morning, but again that hot chocolate was a lifesaver. We think it was colder than 10 degrees when we got up. It makes hiking challenging as well as you can overheat while snowshoeing, but freeze once you get to the top and stop moving. When we got to where we found the sheep yesterday, they were not there, which was not surprising. We ended up snowshoeing and exploring a lot of the area to know more of what to expect the next time we come back. From a higher vantage point we did find some sheep, but they were a very long way away, so we didn’t try to get to them. We got down the mountain in time to drive and explore some more. It was another clear day, and we did find some mountain goats near the road. As the sun went down we also found a couple of real nice scenes over rivers with the sunset. It was a successful winter trip for bighorn, and we look forward to doing it again soon! Glacier Bay and the Summer is Flying By! The summer sure hasn’t slowed down. Right after my workshop to Lake Clark I drove back to Skagway. I did get to see some grizzly bears late at night on the drive, and that was really cool. I was exhausted when I got back to Skagway, but there was no time for that! I needed to catch up on everything from when I was gone, and Twila and my sister and her husbands’ family were coming before July 4th. Yes I do take iPhone pictures, and this was taken at 12:30 at night! I was so excited to pick up Twila from the airport in Whitehorse on July 2nd! It had been way to long since we had been together, and the summer time is crazy and we don’t get to be together nearly as much as we want. On the morning of the 3rd Cara and her family flew in, and it was great to have them here too. It was my sister and her family’s first time in Alaska, which is always exciting. We all took the train into the mountains in the afternoon, and that was fun. At night we had a fire and roasted s’mores and just had a good relaxing evening. July 4th is always a fun day in Skagway, with lots of festivities. It decided to rain all day, which put a damper on the day. But we still went out and enjoyed as much of it as we could. The next morning we were all flying out of Skagway, but going to different places. My sisters flight was suppose to leave at 5 a.m. and ours was at 8 a.m. When we got to the tiny airport they were still there because of low clouds and the planes couldn’t fly. So Twila and I jumped in on the card game and we all waited for the clouds to clear. This is fairly common in Alaska, but still frustrating. They finally got to leave at 9 a.m., but we still couldn’t leave. We finally left at 11 a.m. and took two flights to get to Gustavus, which is right beside Glacier Bay National Park. Because of our delays we missed our whale watching trip, so instead we had a nice relaxing evening and rode our bikes down to the beach. It was nice to relax for a little while! Twila and I riding our bikes down to the beach! On the 5th and 6th we took a boat ride into Glacier Bay to see the sea life, but mostly to see the huge tidewater glaciers. We really wanted to see these large glaciers and get some nice photos of them! The weather cooperated, which it has been super rainy this summer, and we were able to see all the mountains around and the sun even came out some both days. We even had some good wildlife sightings with mountain goats down by the water, a grizzly bear family chasing each other over a salmon, lots of whales and Twila even got one jumping! (and I missed it), sea otters and lots of sea lions. Our boat went to a different large glacier each day, which was what we were hoping for and we got some really great shots! It was so neat seeing these huge glaciers and the mountains surrounding them. We both took tons of shots and had a great time! We flew out the evening of the 6th and flew to Juneau. The next morning we went on a whale watching tour and had a great trip! It was a very bumpy ride, but a fun one, and worth it when we got to the whales and got to see a group of humpback whales bubble feeding! It was Twila’s first time seeing bubble feeding, and I’ve not seen it that many times. We got to watch them do it over and over and was so awesome to see! We flew to Skagway that afternoon and then drove to Whitehorse that night and she flew back to Canmore the next morning. It was so sad to see her go, and our time together went too fast. I’m so thankful she could come and that we were able to go to Glacier Bay! I was in Skagway the next couple of weeks catching up and researching other trips and trying to plan out the rest of the summer. The summer time is one crazy time that never seems to slow down. Before I knew it, it was July 19th and I was flying to Knoxville to go to my little brothers wedding. It was a long flight overnight, and I slept a lot when I got there on the 20th. Twila flew in that night, and it was great to be together again so soon! The wedding weekend went by real fast, and it was really really hot. My brother decided to get married outside in Tennessee in July, and the temperature decided to be 95 and feel like 111. I almost passed out during the wedding I was so hot. But I’m glad I was there and the wedding went great. Seeing so many friends and family was also a great time, and we will get to see them all relatively soon at our wedding! Our wedding will be here before we know it, and we can’t wait! The wedding went so fast, and Twila and I didn’t have much time together alone, so I flew to see her the next weekend. She’s been really busy getting ready for a festival where she sells her jewelry at, so I went to help as much as I could and to also do wedding planning. We ended up doing mostly wedding planning and trying to catch up on that and not fall behind. I had no idea how much planning a wedding is! We were able to have a little other time where we weren’t working on something too. We both really hope the next month and half goes by real fast, and by then I will be done with the gallery and I’ll be back in Canmore and our wedding will be right around the corner! It is now August, somehow, and it finally decided to be summer in Skagway and get into the 80’s, which I personally don’t like and think is way to hot here. I’ll head off to Denali for a couple of weeks and can’t wait for that. The northern lights even decided to give us an early season show, and I got a picture of my BearHead sign with the lights behind it! I was very happy about this and was hoping that I could get that shot! Time is flying by! Good Bye Lake Clark. What a trip! On June 25th we had to fly out at 9 a.m., but we got in one more shoot before breakfast. I’m sure most people wouldn’t have gone out after yesterday and everything we had seen in the past week, but I’m always looking for the next shot. I wasn’t worried about not finding anything, because you can’t think like that. If we saw nothing, oh well, we tried and it was a great week. But we don’t get to go to Lake Clark all the time, and since we were there, we were going to try one more time for another great shot! Let’s just say we were rewarded for getting up early. Immediately we found a different mom that had two second-year cubs, and they were close to the trail. The tide had been extremely high, and the sedge flats were flooded. So they ate where they could until the tide went down. Once the slough was a little lower they swam across and we got some real nice shots in the morning light! Just that moment was worth coming out, and if we didn’t have that moment it would have still been worth it. A grizzly bear family about to go for a swim. We drove around and didn’t see much after that, but right as we were getting to the lodge and be done photographing for the trip, a mom and spring cubs came out. We didn’t have long, but we weren’t going to miss this opportunity. We drove to a place where we could then walk out to them, and what a great last shoot we had! This was a different mom and spring cubs, but she was a bear the lodges knew well and was around every year. She actually walked toward us with the cubs and we had to scoot back to not be in their way! They were in real short grass and even though it was a short shoot, it was a great shoot! The cubs stood and were right beside mom, and mom even stood when they were close to us. But if we had never taken the initiative to go out, we would have never gotten these shots. It was sad to fly back to Anchorage after all we had gotten to see and photograph. My group was extremely happy with everything we got to photograph, and were still in shock mostly because we really got to see so much! I can’t wait to go back next year with my groups, and if interested let me know soon because one of the two weeks is already full. The bears of Lake Clark are hard to beat! Still a few slots left on my first tour next year, but hurry and sign up before they are gone. Epic Last Day in Lake Clark! It’s amazing how with a group, the more you see the more they expect. I understand, it’s just hard to keep meeting their expectations when what they are asking for seems ridiculous. But my group was great and they knew we had had an amazing trip, but why not ask for more. On our last full day one guy came up to me and said he knew we had gotten some great pictures, but he wanted something epic. That’s quite the statement, and he knew when he was asking it was ridiculous, but we had seen so much I held out hope that it would happen. Before breakfast we had some great light and the mom and three-year-old cubs, but nothing came together. The cubs lightly played, but it was always quick and then they would separate. It was going to be a bright sunny day, so we had a quick breakfast and then headed back out. We saw three bears together on the tidal flats, and if something epic was going to happen it was going to be with them. Challenge accepted, and lets go get some amazing shots! I could write for a really long time what we got over the next few hours, but I will let my pictures do the talking. The bears ran, played, fought, rolled around, were in front of a volcano, fought in backlight and in front of a mountain, ran through rivers, and gave us one incredible shoot to remember! And then at the end one bear gave us a real nice shot as a parting gift it seemed. If he wanted epic, that was epic! In the afternoon we walked out to Johnson River Valley again, and a saw a few bears this time. One was real curious and came and checked us out. We even got to see a wolf, which was my first time seeing a wolf in Lake Clark! After dinner we were on the mom with three cubs, and we got some nice shots of the cubs jumping a little slough. We even got her nursing all the cubs in real good light! What a day! Our fourth day in Lake Clark was our only slow day, if you want to call it that. By that I mean it was the only day where we didn’t have something amazing every shoot. We still had plenty of bears and got some nice pictures, it just didn’t feel up to snuff of the other days. But that is wildlife photography, and there will be good days and there will be bad days. It was by no means a bad day; it just wasn’t amazing like the other days. My group certainly started to get picky, but I couldn’t blame them because of how much we had already seen. Early in the day we were with the mom and three-year-old cubs for quite a while, hoping they would play. They were pretty tired it seemed, and didn’t do much at all other than eat. Not long after we found the four-year-old siblings, and we had a great intimate time with them. They did a little playing, but for the most part they didn’t do much but eat. But they allowed us to be close and it was a neat time with them because they were so chill. Once they left my group actually went on a little hill and most of us took a nap. It was such an awesome nap to just lay there with bears around and get a catnap in. A couple people couldn’t sleep and watched for bears, but it was such a good nap! After dinner we went to the beach, because we had been having real good success on the beach after dinner. Tonight didn’t disappoint either. There were some adolescent bears, and a couple didn’t like each other. After running down the beach, they turned and ran onto the tidal flats. We got to hear some nice bear growling, and the lighting was really neat. Just being out in Lake Clark and seeing all the bear behavior we have seen already is so amazing! Two grizzly bears growl at each other in the evening. We went out at 6 a.m. again on the 22nd, but there was nothing out this time. It just doesn’t seem like the bears in Lake Clark are early risers. After breakfast we found a decent size male and spent some time with him, and we were able to get some reflection pictures wit him from a small pond of water. We saw some other bears and a couple went to clam, but it was a slower morning for the most part. However, it was not slow after lunch. When we went back out after lunch we found the mom and three-year-old cubs right beside a slough. It was a real pretty spot for pictures, and we were able to be close to them and get some nice shots! They crossed back and forth across the slough and were calm. Another group came, so we left them so we could look for other bears further down the sedge flats. As we were riding, the mom and spring cubs came out! Exactly what we were looking for! It was nice to see them in the grass, and we slowly approached so as not to scare them. The mom was calm, and so were the cubs. They were in fairly tall grass, so it was hard to get good shots of the cubs. There were a number of bears out, so we didn’t think they would stay long. We were right, unfortunately, and another bear came closer and the mom took off. She stood a couple of times to look at the other bear, and those made for nice shots! She really is a good momma bear. We then went for a hike out to the Johnson River Valley. It really is so pretty out there, and a very different view. The bears out there are a little more skittish, but I’ve gotten good shots out there before. It’s a little over a mile out there, but it’s flat and a nice walk. The first bear took off when it saw us. We didn’t see any others for a while, but on our way back we found another. It was calm and just slowly moved and ate. We spent a long time with it, and it gave us some nice opportunities with the valley behind it. A grizzly bear moves through the Johnson River Valley. When we got back to the trailer, it didn’t take us long to find the spring cubs again, and they were in a much better place this time for photos too. We got to spend some real quality time with them this time, and it was amazing! When the cubs are this young and new to seeing people, they are so curious and stand a lot to try and figure us out. The mom was very calm, so the cubs were as well. They played, and stood and really gave us an incredible shoot! After dinner we went back out, and didn’t find the spring cubs, but found the mom and three cubs. They somehow didn’t notice a large male coming their way, and it got close before they took off running. They headed for the beach, and we followed. We also had good light in the evening for the first time, and with them being out on the tidal flats it made for really great shots! With the reflections and the perfect light it really made for a great evening! After they headed in back to the sedge grass, a smaller bear was nearby. Momma bear was tired of other bears around and gave chase. She didn’t just stop after a short run, but decided to really run this bear off. All of a sudden they came bursting back onto the beach and were running full speed right by us! It was quite exciting and crazy! Our first three days have been absolutely incredible! I was afraid of a letdown over the next couple of days because of how much we had seen already, but Lake Clark in the spring rarely lets me down. There was more to come and I knew it! Mother bear runs full out after another bear. Lake Clark Day 2 and Spring Cubs! On June 21st we left the lodge at 6 a.m. and went out looking for bears. There were a couple of bears out on the tidal flats that we walked out to. Not long after we got to them, another bear came running along and chased them back off the tidal flats, so we went in for breakfast. When we went back out after breakfast, the mom and three cubs were on the tidal flats and we went to them. We got a few shots before they started to head back in, and the cubs got playful as they headed in. A couple of the cubs gave us some nice standing and playing shots, while also being reflected. Two cubs stand and play on the tidal flats. It became a sunny day and we were having some trouble finding bears in the heat. Going along the trail I saw what looked like bears sleeping across the sedge flats, and maybe even on a log, so we walked to where they were. Sure enough, the mother and three cubs were sleeping on a log, with two of the cubs right beside the mom. Two days in a row of bear families sleeping on a log! These photos were really great since we could get a few of them in the same picture! It’s so neat to see them using old driftwood as a large pillow. Once the cubs woke up, they had some energy and wrestled and played not far from us for a long time! While we were at dinner one of my clients saw from the window what he thought were new spring cubs. I popped up to look through a scope before they disappeared, and sure enough it was spring cubs! I was very impressed with how fast everyone ate as much food as they could in one minute, especially since we had just started dinner. But it was the first spring cubs of the year, and we didn’t want to miss them! We all hustled and got out to the beach to see them out on the tidal flats. It’s always so exciting seeing new spring cubs for the first time! We waited patiently for them to pick a spot to get clams, and then we walked out to them. It was the cubs very first time seeing humans, likely, so we went cautiously and didn’t want to scare them. The mom was a very good mom and kept watch and ate at the same time. 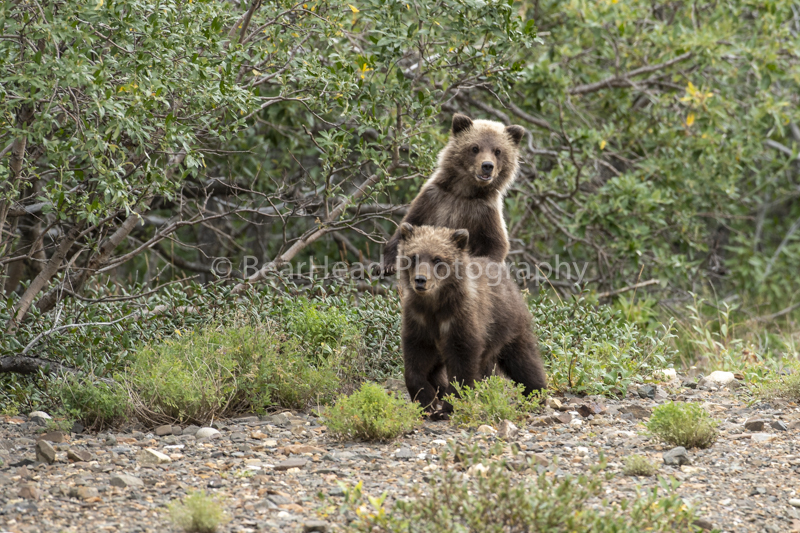 I was impressed that we were able to get in photo range and not make the cubs nervous. We didn’t get a real long time with them before she saw another bear and went the other way, but it was great experience and photo opportunities in the time we had! Finishing the second day off with spring cubs was amazing! After being at the gallery most of the summer so far, I was ready to get out and lead my photography workshop to Lake Clark National Park. I left the gallery on the afternoon of the 18th and drove seven hours into the Yukon and slept in my car on the side of the road. It was nice to finally have some time and be able to think and look back on how things have gone so far this summer. I finished the drive to Anchorage on the 19th, and met me group for dinner that night. It’s always neat seeing everyone for the first time and getting a feel for how the group will be and seeing their excitement for the week ahead! On the morning of the 20th everyone was on time at 7:30 a.m., and we met at the bush plane airport to take off to Lake Clark. It was raining in Anchorage, but not long after we took off it cleared up and we had a beautiful flight down to Lake Clark. Once we landed, everyone was eager to get out and shoot. It was warm and windy, not a good combination for seeing bears, but we finally found a mom with two, three-year-old cubs. Normally by now the mom would kick them out and make them be on their own, but these were still with her. It was neat; because it was a set of cubs we had during my workshop last year. Not long after being with them they began standing and playing and our first shoot got the trip off to a great start! Two three-year-old siblings stand and play fight. After lunch we headed back out and found two, four year olds that were still hanging together. We didn’t get many photos from them, but when we went back around we found the mom and three-year-old-cubs again. Last year we got them sleeping as a family on a log, and they were near this log, so we waited and waited hoping that lightning might strike twice and we would get them sleeping on that log again. Our patience paid off, and they actually slept on that same log! I couldn’t believe it! They didn’t sleep together, but they were still on the same log and we got some nice pictures of them sleeping, even though it was raining. A large cub gets cozy on a log. That night after dinner we went to a different area of sedge flats and found a mom and three second-year cubs. Not long after we were with them they went to the beach, and the fun began. Those cubs had so much fun running, playing, fighting, chasing, playing king of the log, and just being wild cubs. What was also amazing was that we were able to walk behind them enjoying this experience and not interfering with them being wild! It was one of my most enjoyable shoots ever, because the cubs were having so much fun and we got to walk and be a part of nature for over a half mile! They had so much energy and really gave us a show. What a first day! The first couple of weeks of April I spent in Canada with Twila, and it was kind of the calm before the storm of the final preparations for the gallery. I was still ordering things and planning out many details of the gallery, but I knew it would be way calmer than what was coming soon. Twila and I managed to get out into the parks some and look for wildlife, and it is such a luxury that we can do that right out her front door! But on April 15th I flew to TN and the preparations for the gallery hit a new level. My trailer was at my parents place in TN, and I had been sending my new supplies to their place. I flew back to organize everything and get the trailer packed. The amount of things I needed to do in TN in the little amount of time I had was daunting, but I powered through the list. First I had to make sure everything I had ordered came in, and then I had to go around to different stores to get more little items and think of things to take that I can’t get in Skagway, AK. Skagway is a small town, with no other towns anywhere near it, so I have to take a lot of extra supplies for things I might need at some point in the summer because I can’t get them while I’m there. I managed to get everything done in those few days, and then I headed to East TN to work at my Granddad’s shop. My Granddad has an awesome carpentry shop with every tool imaginable, and I needed to make some wooden dividers for my gallery. My Granddad has made wooden things his entire life, he’s in his late 80’s, and both of us couldn’t wait to work on this project together! As soon as I got to his house we hit the ground running. There was no time to waste, as I only had a couple of days. My little brother, Corbin, helped a lot that first day too, and the things I learned from my Granddad and how he knew so much about carpentry was so great! My dad came later that day and it became a team effort to get them made. We stopped at 9:30 p.m. and had made great progress for the first day. Granddad watching Corbin and I cut some wood from inside his shop. The next morning I thought my Granddad might be tired from our long day yesterday, but he was up and ready to help! Just having him there and helping made the project well worth it! The dividers started to come together in the morning, and it was great to see them and how well they came together. There was lots of sanding and lots of aligning the wood to make sure everything fit and was how we wanted it. My Granddad again, had lots of good ideas of how to finish the dividers and make them look great! By the time I left at 4:30 for the weekend with my little brother, they were basically done. I did some playing with my brother over the weekend, and my dad helped add the finishing touches to the dividers with my Granddad. It was a true team effort to get them made in a short time and I appreciated all the help I got, especially from my Granddad! Holding a finished wooden divider with my Grandparents! I headed back to my parents place on Sunday and started packing the trailer as soon as I got back. Packing the trailer is like a large game of fragile Tetris, and it is not easy to figure out. As the trailer began to fill up on Monday, I started wondering how I had so much stuff. When it was all packed, I felt like I had more in the trailer than I did last year, which I didn’t think would be the case. I made a number of changes from last year to this year and I was making more than I realized I guess. It all fit, though, and the trailer was ready for the long drive to Alaska. Now the crazy amount of travel was about to begin. On Tuesday, the 25th, I flew back to Canada and was with Twila only one day before driving to Minnesota. My parents agreed to drive the trailer to Minnesota to help spare me more driving than I was already going to do. I slept in my car somewhere in Montana on the 27th, and finished the long drive to Minnesota on the 28th. My older brother, Aaron, lives near Minneapolis and just had another baby, so I got to see baby Theodore. My parents also didn’t mind driving to Minnesota to see him as well. I hung out there all day on the 29th, and it was fun, and then started the drive back to Canada on the 28th. Swinging with my little Niece Stella in Minnesota! I managed to drive 17 hours on the 29th, which meant I wouldn’t have to drive terribly far the next day. When I got to Twila’s on May 1st, it was great to know that 2/3 of the driving was done and that I would be able to rest another couple of days before finishing the driving. Last year my dad and I drove straight from TN to Skagway, 3,600 miles in 65 hours over 4 days, and I didn’t want to do that by myself. Splitting it up helped greatly. I didn’t do much when I was in Canmore with Twila, because I knew I still had two full days of driving ahead of me. On May 4th Twila and I left Canmore and headed for Skagway. It was great having Twila along to give me company and help the time pass by more quickly. She had never been on most of the drive too, and she loves seeing new places. I drove 16 hours the first day, and made pretty good time honestly. I knew the rougher roads would be the next day, the further we got along the Alcan Highway. The weather mostly cooperated and we didn’t have bad wind and only some minor rain the whole way. We saw a bunch of wildlife along the way too, which was great. I love how much Twila loves wildlife and how excited she gets when see sees bears, moose, caribou and other animals. At 6:30 p.m. on May 5th we pulled in to Skagway, and so much time and energy went into getting to Skagway, and I was glad to be there. When Twila and I made it to Alaska with the trailer! Before a long descent into Skagway. We got to see my new apartment for the first time, I got a different one from last year, that we got to Skagway with no car issues was great. There was no time to relax, as the next morning we started unloading the trailer and getting the gallery ready first thing. Once we had the trailer unloaded and realized nothing was broken from the long trip, it was a big relief. A number of pictures were damaged from the trip last year. I was opening on the 9th, and only had a few days to get the gallery ready to go. Having Twila there for the first couple of days was a HUGE help, and I was very sad to take her to the airport in Whitehorse, Yukon to fly out on the 8th. I wish she could stay all summer, but it just won’t work out that way this summer. By the 9th I was ready to open, but it was more work than I was expecting. I knew I was making changes to the gallery, but they took longer to 100% get right and make the gallery look how I wanted to look. But I was happy I made the changes and the gallery looks great! I continued to finish all the small things as the gallery was open for the first few days, but most guests wouldn’t have noticed what I was working on or didn’t have up yet. The first few days the gallery did well and gives me hope for a good season. My employee will arrive on the 12th and the season will go by fast like last year. It really is a ton of effort on many peoples part to get the gallery open on time, and I’m thankful I have family and friends that are willing and able to help! The gallery is now ready and let the summer begin! The new look of the Gallery! After my workshop, I was ready to get out on my own, and with Twila, and photograph more. The day after I picked up Twila, February 6th, is when my otter video went viral, and my plans changed. Instead of getting out in the park and showing Twila Yellowstone, I was at my friends house answering email requests and phone calls about my video for a couple of days. It was very exciting, but I felt bad because Twila had never been to Yellowstone before, and we didn’t even make it into the park for a couple of days. Once the requests slowed down, we went in the park and I was excited to be back in the park and show Twila how great Yellowstone is in the winter. The weather really didn’t cooperate with us, unfortunately. The wind howled for a few days, and actually shut the park road down a couple of times because of zero visibility and drifting snow. When the roads were ok, we did get to see moose, sheep, bison, coyotes, and distant wolves. I was hoping for her to be able to see a wolf decently close, but we never saw a wolf except through a spotting scope. Twila and I enjoying the snow in Yellowstone. We went on a snowcoach to Old Faithful on the 9th, but that didn’t go how I had hoped either. We got to go in for free with a friend of mine, and I was excited to show her the geysers and hot springs around Old Faithful. However, it was a warm day in February and it decided to rain, and not snow. I had never seen it rain in the interior of the park in February. I was bummed it had to happen on the day we went in the park. We did watch Old Faithful erupt, but it was too wet and nasty to walk around and look at the other thermal features. She will just have to come back and try again next year. It was sad seeing all the snow melt from the strange warm up, and having brown patches appear in the snow. Just a week ago there was so much snow, and now ground was showing underneath. It’s amazing how fast nature changes things. I was getting discouraged, so we went to West Yellowstone to visit, and for Twila to meet, some good friends. It was nice to relax there a couple of days and to visit with them. We then went to the Grand Tetons to see the beautiful mountains there, and the wildlife. 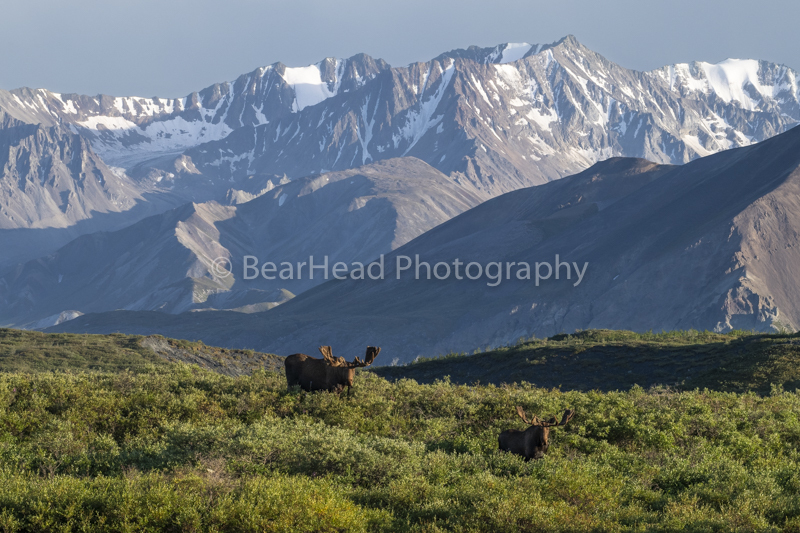 The Elk Refuge is a very neat area, with thousands of elk residing there in the winter. Twila had never seen so many elk in one place before, and she loved it! I even got a nice shot of an eagle taking off from a cliff at sunset as she watched the elk. We stayed with my friends in town, and it was fun seeing them again too. An eagle takes off from a cliff at last light. On Valentines Day we went back to the refuge in the morning, and my car got washed by the big horn sheep licking it. This thrilled Twila, and she loved every second of it! We, of course, then took a drive to see the beautiful Teton mountains, and they are a very scenic mountain range. That afternoon Twila spotted a red fox and a great grey owl! I was impressed with her ability to spot wildlife, and it’s great that she loves seeing wildlife so much! We went out in Jackson that night, but we had to leave early the next morning so we didn’t stay out too late. One of the big horn sheep cleaning my car stops and checks out Twila. We got up at 5:30 a.m. on the 16th and hit the road back to Canmore, AB. It was a 12-hour drive, but the roads were good the whole way and we made it to Canmore in one day. Twila had work she needed to get done for her business, and I needed to start planning everything I needed to get for my gallery this summer. I was glad Twila made it to Yellowstone and the Grand Tetons, but the weather didn’t cooperate. But at least she made it and we had a great time together and next year will be better for her. It was nice being back in Canmore and relaxing after the past few weeks of craziness. I went out and explored Banff National Park some, but didn’t have much success for the most part. Once I started planning for the summer, I couldn’t stop myself. There was just so much to think about for everything I wanted to bring back from last year and try to change: what to replace, what do I need more of, what signs to change or make new ones of, what sizes of new pictures, and the list goes on. The more I did, the more I thought of that I needed to work on. I’m thankful year one of the gallery is done, and that I now have more experience and knowledge of what my customers are looking for. It was a very different feel preparing for the gallery this year from last year. Working on the gallery was made easier by where Twila is now living. Last year she was in downtown Vancouver, BC, and now her place is in the mountains and has a great view! There is just something about looking out the window and seeing only beautiful mountains. Seeing mountains out the windows even helps me work inside better. We’re not sure where the time went, and before we knew it, it was April. March absolutely flew by, and that means the summer is getting close. I feel much more prepared for the gallery this year, and I am looking forward to it. I will have to do a crazy amount of traveling between now and being in Alaska in May though. Let’s just say my trailer and pictures are all in Tennessee, and I am in Canada. Let the craziness begin! I came across this video recently that I took while in Canada for the polar bears a few years back. These fox had just had a territorial dispute, and then decided to jump around after they were done. It's funny and I thought you would enjoy it. Through the 2016 holidays, it was nice to see family and catch up on many much-needed projects. The Christmas season is a busy selling time, as well, but I was still able to see everyone I wanted to see back home and many extended family members. Once the New Year came, I headed back to Canada for a few weeks to be with me fiancé in Canmore. I was excited to be back with her and scout out the Canadian Rockies for wildlife. It was cold and snowy while I was in Canmore, but I didn’t have a whole lot of luck in locating much wildlife other than elk. I always enjoy going to Yellowstone in the winter and searching for the wolves, and other animals. I left Canmore on the 24th to scout for my upcoming workshop that started on the 28th. I did manage to see some wolves in those three-days and figure out where they were hanging out, but they were very far away when I did see them. There has been a good amount of snow this year, which was nice because there weren’t any brown spots showing like there has been in years past. The animals didn’t cooperate for me in those three days to get many shots, but I felt confident I could find them when we come back to the north on my workshop. On the night of the 27th I went and stayed with some friends in Livingston, MT, and then on the morning of the 28th I went to Bozeman to get my group. I was excited for the workshop to start and help them find and photograph the wonders of the Yellowstone Winter. We headed to West Yellowstone after I had gotten everyone, and that night we went out to shoot the sunset. The next morning would be our first in the park, and we would go in from West on a snow coach. This was the very first sunrise of our workshop! So great! Everyone was excited and ready on the 29th, and at 7 a.m. we headed into the park, and my good friend Justin Parsons was our driver guide as well. It was forecasted to be the coldest morning of our time in West, so we headed toward Old Faithful first thing to try and get frosty bison. The sunrise that morning was absolutely incredible, and a great way to start the workshop! I wish it had been colder than 5 degrees, but we were still able to find some bison that were covered in frost in the thermal areas. We spent a long time with the bison and headed back toward the Madison River. We got there after lunch, and as we were looking for a bobcat, another coach had already spotted one and everyone rushed out. It is always such a treat to see a wild bobcat! We were fortunate to watch it across the river for a few hours that afternoon as it stalked ducks and waited for an opportunity to pounce. It never did jump, but we got great shots of the bobcat! It was a great first day of the workshop! A bobcat laying patiently waiting for a duck to swim by. On the 30th we headed to the Grand Canyon of the Yellowstone and Hayden Valley in the morning. It was so nice being the only group at the canyon in the morning, because in the summer that never happens. It was a nice day, so we headed into Hayden Valley while the light was still good. We photographed a famous tree there, and then further down the road found a red fox. It was a very cooperative red fox, and we got to watch it hunt as it moved along the endless snow ridges. It even decided to come our way and walked right up to us and onto the road! Once it crossed we kept photographing it, and it went on a ridge with the beautiful dark clouds behind it! A red fox beautifully set against a dark sky. We had heard otters were near the canyon, and we had great timing because the other groups had come to look for the fox we had and we went to the otters, where 50 people had been. When we got there we were the only ones there, and the otter pups were so playful. They played and played and played and ran around and were so fun to watch! A bald eagle flew in after a while and landed on a tree close to the road! It was one of the best otter experiences I had ever had! We went to Artist Point to photograph the canyon, and when we left we found the otters again and had to stop. A different bald eagle was in a tree nearby this time too. The otters weren’t as playful this time, but were still active. One otter went running and sliding our direction down the frozen river, and it was great to photograph! If he did it again I thought I would take a video of it because it was so neat. Some time later it did it again, and I videoed it running and sliding on its belly numerous times! I never thought this video would go viral, but nature and wildlife sure can capture people’s hearts! We even managed to catch a glimpse of a bobcat that evening. What an incredible first couple of days! A family of river otters wrestle on the edge of the ice. One of my best bald eagle shots in Yellowstone ever! The 31st was our last day on the snow coach, and we headed to Old Faithful again in the morning. We followed wolf tracks for a long time, but never saw the wolves. It was a very windy day, which wasn’t a good sign for trying to find wildlife. Animals don’t like wind, and will hunker down in the trees and wait for the wind to die down. We shot some thermal features, but it was hard to photograph in the blowing snow. On the Madison River we found more coyotes, and even got to watch one try and fish in the river. Later that day a bobcat was spotted, so we got to see a bobcat again! 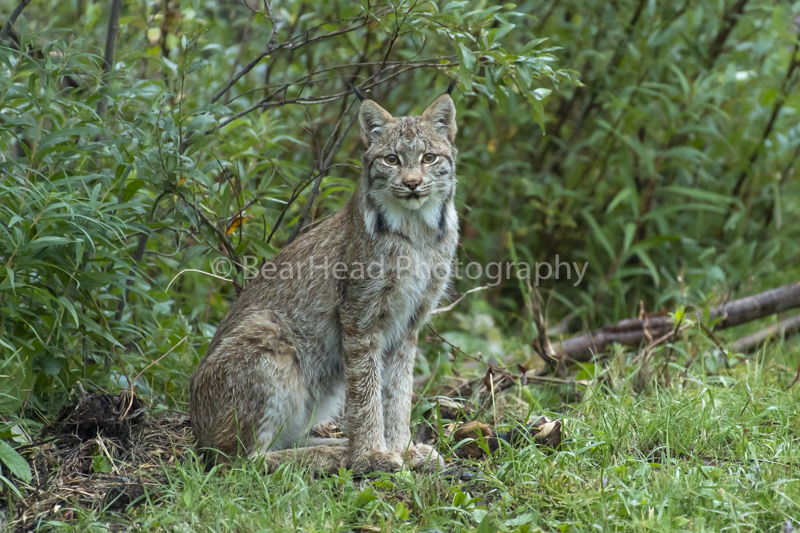 I can’t believe we got to photograph the bobcat every day of our trip in from West! Our time in West went better than I could have hoped, then on the morning of February 1st I drove the group to the Northern Range of Yellowstone. It was not a fun drive because of the snow and wind from last night that iced up the road. We made it safely, and then that afternoon went in to the park and checked out the northern range. We found some big horn sheep and coyotes on our afternoon run, but it was just good to see that part of the park and refigure out where the wildlife were in the north. On the 2nd we left Gardiner at 6:30 a.m. and it was snowing hard when we left. It didn’t let up, but when we got to Roosevelt Junction, a mother and calf moose were right off the road. It was still a little dark, but they were right by the road. We were able to stay with them for a little while as they moved near the road. It snowed so hard when we were with them, but it made for a dramatic scene. A great start to the day! We continued on to Lamar Valley, but it was snowing so hard you couldn’t see anything. A large bison was on the road, and we were able to get ahead of him and pull into a pullout and let him walk by. He was beautiful and fully covered in snow. It had been a very long time since I had seen it snow that hard in Lamar. The roads were getting dangerous because of how much it was snowing, so we headed to Mammoth hoping it wasn’t snowing as hard. It was snowing just as hard, but we photographed the terraces anyway, and it made for a neat scene. We called it a day a little early because it wouldn’t stop snowing and the visibility was so bad. A moose moves through a meadow during a heavy snow storm. We left at 6:45 again on the 3rd and headed into the park. It was a quiet morning, but when we got back to Pebble Creek we found a small bull moose bedded. We waited for him to get up, and it was a beautiful scene when he did with the trees fully covered in snow. It snowed off and on throughout the day, but nothing like yesterday. My group really wanted to see wolves, as did I, but it is never an easy task. Most days, if you see them, they are really far away and you have to pray you are in the right spot if they do come close enough. Around lunch I was able to show them a pack of eight wolves through a scope, but they were over a mile away. This is what wolf watching is like over 95% of the time in Yellowstone. 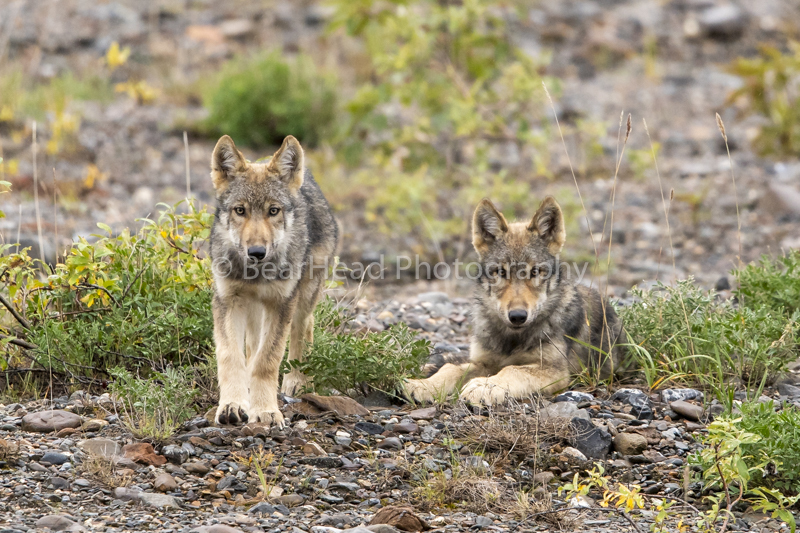 Wolves are, in my opinion, the hardest of the large mammals to photograph because they are skittish and hate people. We saw some wildlife that afternoon, but didn’t have many opportunities other than with moose. A young bull moose stands in front of heavily snow covered trees. Our last full day was the 4th, and when we went in that morning the wind was absolutely howling. On the Blacktail Plateau the snowplow hadn’t been up there yet, and I was plowing through 3-4 foot drifts! It was absolutely crazy! I only did it because I knew the road, and was surprised I didn’t get stuck honestly. It was super windy across the whole park, which almost never happens. Nothing was out because of the wind, but we did find one large bison fully covered in snow. The wind blowing created a dramatic scene at times, and we stayed with him a long time because I knew there was nothing else out. The roads were very dangerous and we had to wait on snowplows a couple of times to clear the road of snow. We went back to Mammoth because of how dangerous it was, and that nothing was out. A wolf pack was on a ridge above Mammoth, but again way to far for pictures. We photographed the terraces in the sunlight and then went in. There was no way I was driving back out with how dangerous the roads were. The wind blows snow around this snow covered bison. On the 5th we put everyone’s luggage in one room and then headed in at 7:30 into the park. I am dropping them off today, but no one’s flight is until the evening, so we went in the park in the morning. It was again very windy and very little wildlife was out. Four large bison were near the road and in a nice scenic spot. A couple of times the wind kicked up and made for a very nice cold windy scene! A little further down the road we found a moose, and he came close to the road. Then he turned around and crossed the river! It was a great way to close out the workshop! We drove to Bozeman and I dropped everyone off by 4 p.m. A great way to relax after a long, but great, workshop was to watch the super bowl with friends! A very windy day makes for a dramatic scene in Lamar Valley. A moose walks across an open river during the winter. Overall I was very excited for how the workshop went! We saw so many different species of animals, and all of those species gave us an opportunity to get good pictures except the wolves. I know wolves were on the top of everyone’s list, but I can’t define a workshop by wolves only. They would have been great, but we were able to get great shots on many species, including the elusive bobcat. Twila flew in the night of the super bowl and I can’t wait to get to show her Yellowstone for her first time! If you haven’t seen my video of the otter sliding on it’s belly that went viral, click on the video below this blog! It got over 70 million views on facebook! My Viral video of an Otter Sliding on Snow! I caught this otter running and sliding on a frozen river in Yellowstone National Park a week ago. It was so much fun to watch and it was having so much fun! Enjoy watching! October was just what I needed! The summer was so busy that I didn’t have time to think about many other aspects of my photography and business. After closing the gallery, and then photographing the elk rut, I finally had a chance to relax for the first time in months. I was looking forward to falling back into what I had known as my past, and not having day-to-day responsibilities. I thoroughly enjoy the freedom my job allows, and the ability to go anywhere at any given time. Before this summer, I was use to photographing, and then taking a break, and then photographing more. There were no breaks this summer, because when I wasn’t photographing, I was in my gallery in Skagway. And it will likely be that way for years to come. I didn’t realize how much the summer had drained me until I began to fully relax. I was so caught up in the gallery, and trying to make it successful, that many things fell through the cracks. I envisioned only needing a short amount of time to be caught up on most things, but I was wrong. The more I relaxed and looked back on the summer and other needs of my business, the more I realized I had lots to do. I’m grateful I was able to take a step back and analyze the summer, and my business as a whole, and see how things went and how I would like them to go in the future. As my career has changed and progressed, I have enjoyed each new twist and turn. I’ve never known where I was going to be from year to year, but now that has changed some too. I will still have many unknown during the fall and winter, but for the spring and summer I will be in Alaska. I can think of many worst things that being in Alaska, though. All that spare time I use to have as I got my business going, is long gone. I enjoyed all the unknowns and paths that I’ve taken to get to this point in my career, and look forward to the future ones. I got caught up in this summer, and got away from a couple of thing that has made my career so great. October allowed me to see that, and to hopefully not have that happen again. Relaxing and a distressing of the mind were critical for me. I needed to get back out in nature, and forget about all the other things of the world that catch so many people and don’t let go. I did a fair amount of work in October, but it was the times I didn’t work that made October great. Exploring new areas and finding new places to photograph is what excites me the most! There is so much area in our great continent to explore and search. My fiancé recently moved, and spending time with her in the mountains around her area was great! I did a lot of pre scouting for the winter, and now can’t wait for winter to get here. It will be exciting to see what winter brings in this new area to me. A beautiful scene in my new home. On November 10th I hooked the trailer back up and begun the long drive to Tennessee. I wasn’t looking forward to the three-day drive, but it had to be done. My truck has started to have a little transmission issues, but I figured I could make it back to TN. It did fine across the country, thankfully, and after 39 hours of driving I got back to Tennessee. I have a gallery exhibit in my hometown of Tullahoma that opens on November 19th from 5-7 p.m. at the Fine Art Center. As the days of September ticked away, I got closer and closer to packing up the gallery and heading south. By September 12th I was ready to go, but still had a few days before I would take the gallery down for the winter. It’s not that I didn’t enjoy having my own gallery, but I was just exhausted from an extremely long Alaskan summer. I knew going in that it would be mountains of work to properly get my gallery up and running, but it turned out to be even more than I had planned. It was nice knowing my first year was almost done, and how much better prepared I would be for next year. The last day the gallery was open was the 16th, and as soon as it slowed down that afternoon, my employee and I took the gallery down and packed it for the winter. I left a number of things in the gallery, as I will be back next year, but took many of the prints with me. It only took a few hours for it to come down, and I hope setting up next year will only take that long. We got it all packed up, and by that evening I was on the road heading south into Canada. Standing in front of my gallery the last morning it was open. On the drive south, I finally had time to look back on the summer and evaluate most of what had transpired. May seems like years ago, because of how much took place over the course of the summer. It’s amazing to think back on how I thought things would go at the beginning of the summer, and how many things ended up turning out. I’m sure in the coming weeks I will have more time to sit and think about the summer, but on the drive it was nice to not have to worry about how the gallery was doing for the first time in months. My brain was ready for a break, and photographing in the Canadian Rockies would be the perfect medicine. After over two full days of driving, and almost 30 hours, I got to Canmore, AB, which is where my fiancé had moved. I was very happy my car made it there with no problems, because it has started to act up a little, but it also has 264,000 miles on it! It has been a beast, and I plan on riding it until it dies! After only a couple days of rest, we headed out to go photograph the elk rut in the Canadian Rockies. Photographing is always where I am the happiest, and also not thinking about the gallery while out photographing was extremely nice. A number of my photographer friends were out photographing too, and it was fun catching up with everyone. The elk rut was in full swing, and on our first morning a large bull gave us a good chase. That was Twila’s initiation into how crazy the elk are this time of year. She is a quick learner, and that was the only really intense moment we had on the trip. Soon after he chased us, I ended up getting my favorite picture of the trip. His females decided to swim a river, so he went after them, and it was very foggy and hard to see, but it made for a very dramatic picture with the elk in the river! A bull elk stands in a river surrounded by fog and looks for his females. It was nice seeing some of the bull elk I had seen last year back, and them be even larger this year. Over the course of 10 days, we fully immersed ourselves into the elk rut and got some great photos! There were two elk that were particularly dominant, and all the other elk would run from them. I was really hoping to get to photograph a fight, but it didn’t happen unfortunately. There had been fights before we were able to get to the park, but by the time we had gotten there most of the hierarchy of elk was already established, and the challengers would just run away. A bull elk bugles in the last light of the day. One of the nice things about the elk rut is, even though you may not know exactly where the bulls are sometimes, if you sit long enough you would hear one bugle. The elk bugle is one of my favorite sounds of the mountains, and it is so majestic hearing them call out and hear it echo throughout the valleys. It is such a powerful sound, and one that gets my heart beating. I particularly like the cold mornings when you can see their breath as they bugle. Being in the woods with them during the rut is exciting. You really have to stay on your toes, because they are pumped up on testosterone and can charge at any second. On a frosty morning, a bull elk releases a lot of steam. We were also excited to be back in the Canadian Rockies, because it is where me met exactly a year ago on September 21st. I was actually photographing a bull elk, and Twila was a tourist who happened to stop that day. We ended up hitting it off, obviously, and we both have a deep love of wildlife. But being back in the place where we met was special. It just goes to show you never know what will happen in the mountains! My favorite elk comes my direction in the woods. Over the course of the 10 days I was able to capture some nice behavior, and capture them in many different environments. When they are on the riverbank or in the river is when I like to photograph them the most, and I had a few opportunities when they were there. One day a couple friends of mine and I followed a bull elk as he left his cows and went to look for more. It was a neat experience walking beside him for nearly three miles and just seeing more into what an elk does in the rut. One of the biggest things during the rut is that they are unpredictable, and I like the thrill of discovering the unknown. A bull elk looks over his harem as they cross the river. The northern lights were also out a few nights, and one night we stayed up to look for them. They came out for us, and we went and watched them over a lake. It is always a neat experience seeing the lights and watching them move across the sky. It was a calm night too, which made for some nice reflections on the lake. The northern lights and the big dipper are reflected into the lake. By the 28th I was ready to go and get back to Canmore. My body was running on empty from my summer and the past 10 days, and I didn’t have the energy I was accustomed to having. We left after the morning shoot, and the nice thing about living in Canmore is that it is only a short drive away. I fully realized how exhausted my body was when we got there, because for the first few days I couldn’t stay awake later than 9 p.m. But again, I wouldn’t change any of it. I’m looking forward to just relaxing and hanging out for the next number of weeks and catching up on photos from the summer. I was so busy this summer I didn’t have a chance to organize and really go through most of my photos. But I should have some time coming up, and will try and get caught up on my pictures while also relaxing. It’s crazy to think that my first year of having a gallery is already over. What a summer it was, and now to relax and look back on the summer and prepare for next year.